The Doctoral School of the University of Málaga will prepare, at the end of each year, a report containing information on all activities carried out during the previous academic year; the theses read, the agreements reached by the PhD programmes, and their academic achievements. The report will also include all other relevant information which allows the University Community and their Corporate Partners to learn about the school’s activity. The Doctoral School of the University of Málaga will prepare a report each year on the quality of all the PhD programmes affiliated to it. This will be based on the performance indicators of each one. 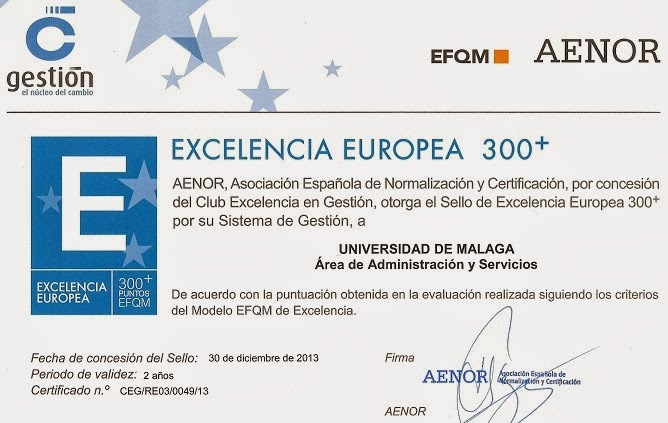 Quality objectives and policies: This enables the school to consolidate a culture of quality based on known and publicly accessible policies and objectives, in accordance with those pursued by Málaga University. Design of training offered: This allows the school to be able to count on mechanisms in place, which enable the training on offer to be maintained and renewed, developing methodologies to approve, control, evaluate and thereby improve the quality of its teaching. Teaching development and other initiatives orientated towards doctorates: The school has mechanisms in place with which the actions taken by the docorates, including mobility, can be assessed, to ensure that the end result favours the training of the doctorate. Teaching and research staff; administration and services staff: Mechanisms in place, which ensure that the access, management and training of the school’s personnel, specifically the teaching and research staff and the staff of the administration and services are realised, with the necessary guarantees so as to ensure they can fulfill their roles to the best of their abilities. Services and physical resources: The school has various mechanisms in place to design, manage and improve its services and physical resources so as to ensure the appropriate educational development of its students. Training results: In order to make decisions and improve the quality of education various mechanisms guarantee that certain criteria, the outcome of student learning, insertion in job market and the satisfaction of the various groups involved, are all analysed and the results are used in the decision making process. Public Information: The school has mechanisms in place to guarantee the periodic publication of the latest information related to the PhD degrees and programmes. /cms/secciones/ajax/insertar_seccion/ /cms/secciones/ajax/borrar_seccion/ /cms/secciones/ajax/editar_seccion/ /cms/secciones/ajax/mover_seccion/ Are you sure you want to delete this section? 12541 You are about to cancel the edition. All your changes will be lost. Do you want to cancel and lost your changes?